Andaman is a beautiful place to visit. It’s kind of international tourist destination people who are fond of island and beaches. With kind and helpful people it makes the entire trip very easy and exciting. The lovely weather adds a sweet flavor to it. Numerous and famous island attached to the port blair makes it more beautiful and lively. Having a candle light dinner next to the beach with your beloved is an life time experience. You can get all types of meals which includes all the south indian meals, north indian meals, oriental and even continental at some places. AFC is good place at port blair to have andaman fried chicken. They keep fresh chicken. Then Annapurna is nice and good place to have any north or south indian meals. Another place is Blue Sea Hotel restaurant. At Havelock Island there is a restaurant named as Blue Moon. They serve most of the international cuisine there. Try Nariyal Paani any where to quench your thirst. Sight seeing at port blair consist of Cellular Jail’s light and sound shows.Then there are numerous aquarium to spend your leisure time. Ross Island is a very beautiful island to visit.Then at middle port blair(andaman) you can even see limestone caves, only thing is that it takes 12 hours to reach limestone caves from Veer Savarkar Airport. Bus service starts by 4 in the morning.Last but not the least Port Blair’s beautiful beaches are amazing. Sea green , blue water and nice and clean beaches are very rare to see in India. For shopping Abadin Bazar is the best place. You can get everything over there. There is one more good market there known as middle market. 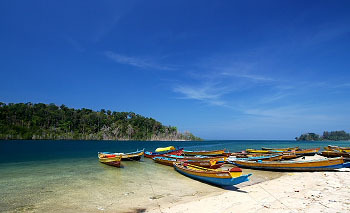 Activities at Port Blair (North Bay) are Water Sports. At north bay water sport are open. Water sports such as Speed Boat ride, Sofa ride, Banana ride, Jet Ski ride, Snorkelling, Scuba Diving are all open to tourist. At Havelock island water sports facility are open but its bit expensive. Corals can be seen at North Bay island with naked eyes Another activity is ship ride from one island to another. Ship ride is amazing. You can come out in open or even can sit on the deck of the ship (once you have the captain’s permission)and can see the waves moving and roaring high while the ship strides on towards the island. Best way to get at Andaman is the air plane. It takes approx. 2 hours from Kolkatta or Chennai. Avoid going in monsoons as the weather and ocean are worst in that period. Travelling in ship to Andaman takes approx. 5 days and the headache that you’ll get once you reach the island takes about one week to get rid off. Keep necessary items with you such as first aid box, torch, scissor, plastic bag while travelling.